Using any sort of mathematical formula (as I had been doing) is simply not satisfactory to predict the metagames of these events. With that in mind, and after talking with the great Sam Chen (@samstoise), I've developed a new way of creating Deck Power Rankings, which should debut soon and will (I hope) serve as a drastic upgrade over last year's design - as well as possibly dramatically change the way players, at least less-well-established ones like myself, approach metagaming for Regionals and other high-level events. For now, I've analyzed the results of a random sample of League Cups taken from the last two weekends (starting during the weekend of Worlds). The sample contains 13 Cups in total: 9 Standard and 4 Expanded. Yes, this does mean the sample size for Standard is larger and thus the analysis thereof is most likely more accurate; and yes, Expanded is the format for the next Regional. However, the Expanded sample (1016 CP in total, since each Cup had at least 24 Masters and thus the Top 8 at each earned CP) is large enough to give some sort of indication as to what the format looks like right now. I'll briefly cover the Standard results first, and then go into a bit more detail on Expanded since that's what most players' eyes are on right now with Fort Wayne Regionals just around the corner. Following a World Championships in which it took two Top 8 spots and then went on to win, Gardevoir-GX looks to be the most dominant deck in Standard at the moment. 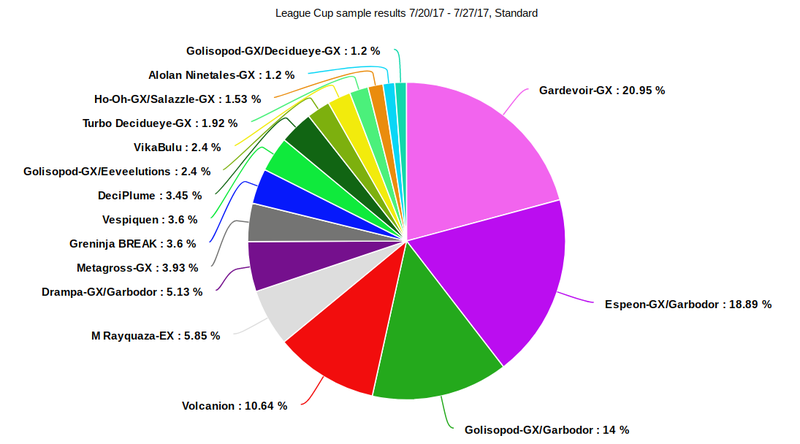 However, it doesn't have nearly as much of a lead over its nearest competitor (Espeon-GX/Garbodor) as we've seen in the past - notably when Yveltal-EX, DeciPlume, or Drampa-GX/Garbodor had strangleholds over Standard at various points during the last season. Indeed, the distribution of decks above suggests that Standard is a pretty healthy format at the moment, with the sample including 15 different types of deck (64 decks in total). Tier 1 deck in Standard? Of course, this tier list is pretty irrelevant with rotation approaching in literally the next few days. I expect Metagross and VikaBulu* to rise in popularity in the new format, with Golisopod/Garb and Greninja seeing less play and M Ray and Vespiquen of course disappearing entirely on account of their main cards being rotated. Next weekend's Cups, which will take place in the new BRT-BSH format, will undoubtedly be far more useful to analyze, so I'll hold off any further speculation until then. *On a personal note, I played against VikaBulu twice at a League Challenge on August 27th and was impressed by how the deck set up blazingly fast and took clean KOs in both matches. I've tested it a considerable amount since then and truly believe it to be one of the strongest decks in the new format, with its only unfavorable matchup being Metagross in my experience. Note that I made a small error in the chart: Rainbow Road is supposed to read 4.92%, the same as the two decks surrounding it. And now for the more important of the two formats right now, at least for those of us playing in (or watching and analyzing) Fort Wayne Regionals next weekend: Expanded. 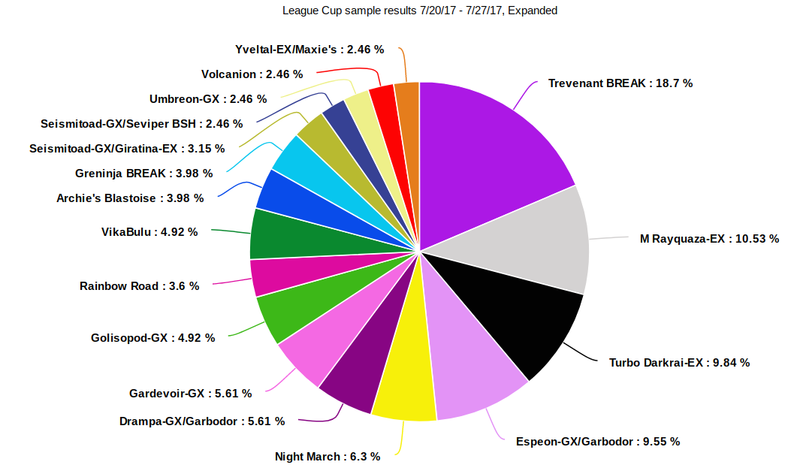 A look at the results in the pie chart above tells us that, as expected, Trevenant BREAK is the deck to beat. 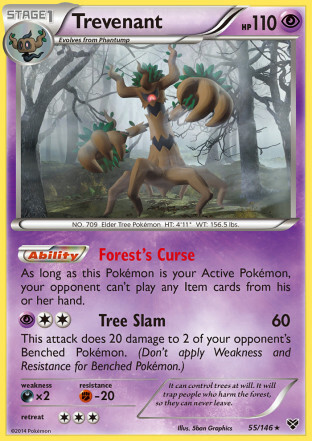 The ban of Archeops and Forest of Giant Plants leaves Trevenant as essentially the most oppressive card in Expanded, and players have capitalized on its synergy with Necrozma-GX for a massive spread-damage assault. is once again the king of Expanded. 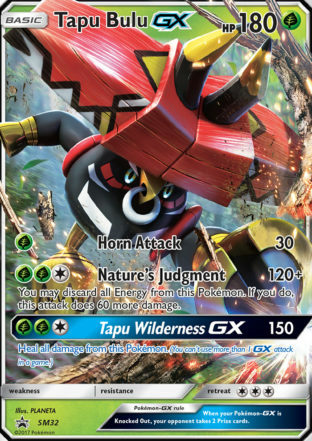 However, Trev isn't invincible: a tech Giratina promo can cripple it when used correctly, and Turbo Darkrai-EX, the third-ranked deck above, hits for Weakness to keep it in check somewhat. For its part, M Rayquaza-EX, the second-ranked deck, can generally set up in a single turn if it either goes first or plays down a Hex Maniac, and then proceed to Emerald Break any opposing Trevenant without regard to Item lock. Be that as it may, Trev still has a lead of over 8 percentage points over Ray in the chart, and it's probably not going anywhere, especially with that nasty Tapu Lele promo that caused a small fiasco at Worlds. Garbodor feels very strong. It changed Standard and since Expanded decks play so much items, it may warp Expanded as well. Based on the pie chart, players attending Fort Wayne should probably expect to play against Trev, Darkrai, M Ray, Night March, and Garb variants, and should pick one of these decks OR a deck with good matchups against a majority of them. With the recent ban announcement, Expanded is looking to be a much more interesting and enjoyable format, and I hope to see some creative decks and intense matches at Fort Wayne Regionals in a few days. As I mentioned at the beginning of this article, I'm developing a new system for Deck Power Rankings that I hope to debut very soon, if not in time for Fort Wayne. Stay tuned as PokéStats kicks into gear for the new season!